Non-superimposable mirror images of each other, such as hands and feet, are referred to as chiral objects. One image is clearly right-handed, and the other is left-handed. A ball and a basic drinking glass are some examples of achiral objects, which means the object and its mirror image look the same. Chirality is an elementary concept in science and other related disciplines, such as medicine. In the 1950s and early 1960s the thalidomide sedative was prescribed to pregnant women around the world, but the drug caused terrible birth defects in a number of babies. The reason was later correlated to the chirality of the thalidomide molecule, where the left-hand molecule was a sedative, while the right-hand molecule was the one that caused fetal abnormalities. No study has been carried out regarding the similar “handedness” in large area films with atomic-scale accuracy up until now. 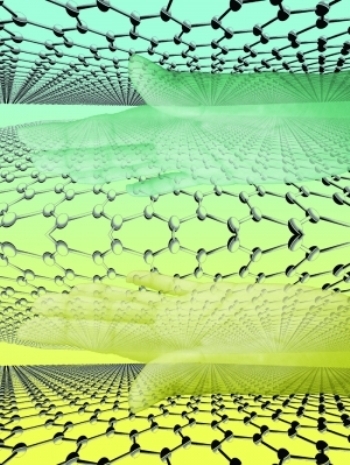 Jiwoong Parks research team at Cornell have developed a breakthrough material - a chiral atomically thin film that measures just 2-atoms-thick, and was created by circular stacking of graphene. This material is likely to be adapted into a variety of fields including; optoelectronics, stereochemistry, polarization optics, and spintronics or spin transport electronics. “I would say that we’ve been curious about this for a long time, whether we can make this material,” said Park, associate professor of chemistry and chemical biology and an executive member of the Kavli Institute at Cornell for Nanoscale Science. This discovery and its confirmation may have a lot of implications in both pure and applied science. This may be applied for sensing biomolecules, and to induce and control asymmetric catalysis, among others. I am sure this discovery opens new research directions for other 2D materials. Cheol-Joo Kim, a postdoctoral researcher in chemistry and chemical biology, and former Cornell postdoc Yui Ogawa grew sheets of graphene on copper for the experiment, and cut them into a number of sheets. Next they stacked the sheets, with each sheet subtly rotated prior to being placed on the one below. The rotation was performed clockwise for one stack and counter-clockwise for the other, creating left-handed and right-handed stacks. Alternating right-handed and left-handed beams of circularly polarized light was shone onto the stacks, and circular dichroism (CD) was calculated. For instance, the CD of 3D glasses is what enables one to view a movie in 3D. The team realized that the CD of the graphene film was stronger than expected. This atomic-scale discovery happened after a series of hurdles, and “that was when the whole process accelerated,” Kim said. The team chose to work with Noguez to quantify its results. It’s one of those rare cases where we knew exactly what we wanted, so we knew what quantity had to be calculated. It’s not an easy calculation, and we did a lot of research and realized that Cecilia is the best person to do this. Initially Noguez and her team were puzzled by Park’s findings, however upon further testing they realized the research was a breakthrough. We predicted a long time ago a similar behavior for single-wall carbon nanotubes and more recently in ligand-protected metal nanoparticles. So in the end, those results made sense to me. The Park team’s paper, titled “Chiral Atomically Thin Films,” was featured in the Nature Nanotechnology journal, February 22. Park and Kim designed and performed the experiments, and are co-authors of the paper. Other contributors include Zack Ziegler ’16, an engineering physics major. The researchers used the Cornell NanoScale Science and Technology Facility, which is supported by the National Science Foundation (NSF), to fabricate the sample. The NSF (through the Cornell Center for Materials Research), and the Air Force Office of Scientific Research supported the research.